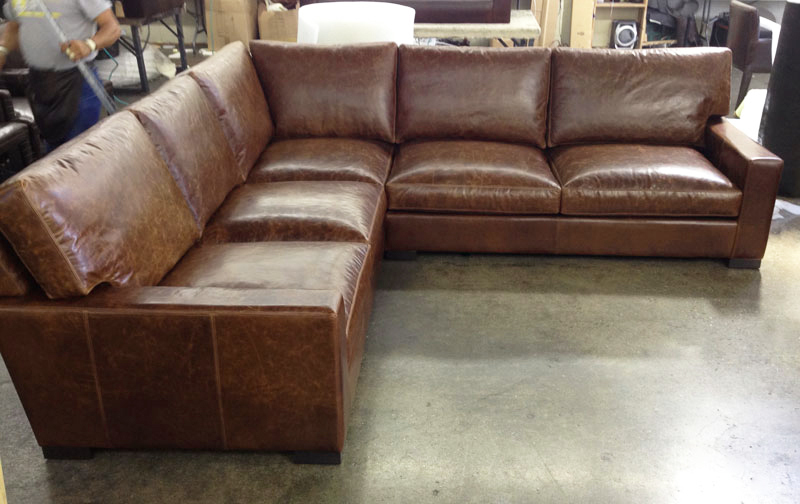 This beautiful Braxton Leather Mini L Sectional was delivered closer to home, in Long Beach, CA. 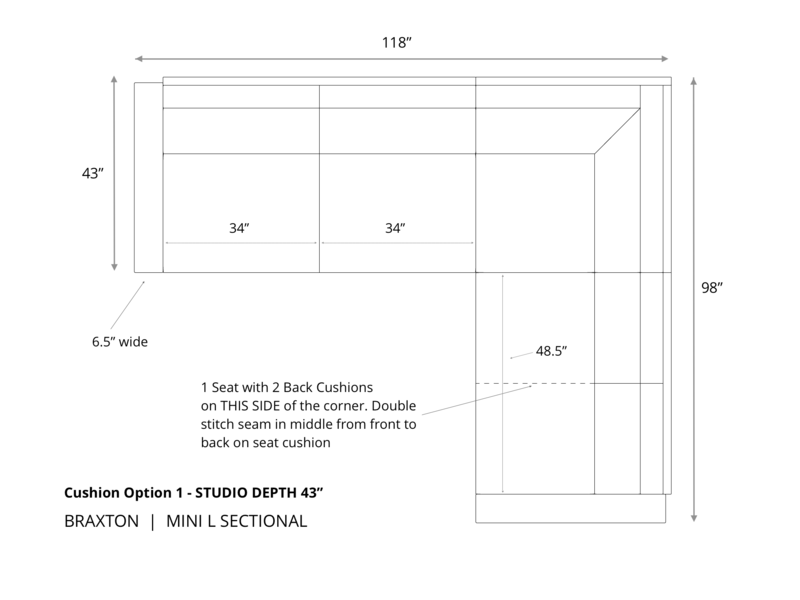 This customer opted for Cushion Option 1 in the 43″ depth (dimension diagram below) and selected our Italian Brompton Classic Vintage Leather, which will lighten slightly with use as it distresses. 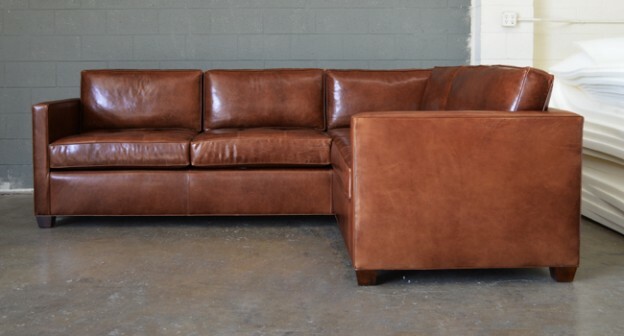 This entry was posted in Braxton, Custom Leather Order Feed and tagged 43" Deep, aniline dyed, Bench Cushion, braxton collection, braxton leather sectional, Braxton Mini L Sectional, braxton sectional, Brompton, Brompton Classic Vintage, Brompton Vintage, full aniline, full grain leather, Italian Brompton, Leather Sectional, Leather Sectional Sofa, maxwell leather collection, maxwell leather sectional, No Ears, pure aniline on May 17, 2018 by LeatherGroups. 1 RAF Chair, 2 Armless Chairs, 1 Corner Chair and 1 Bumper Ottoman. This customer opted for our True 8-way Hand Tied Suspension system to support the Reno’s cozy pillow-top cushions. 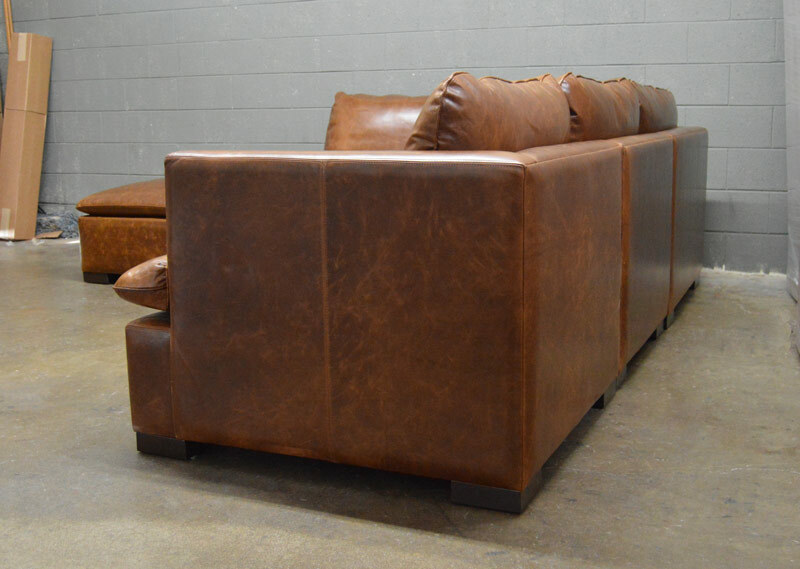 We know this sectional will be in service for a long time to come! 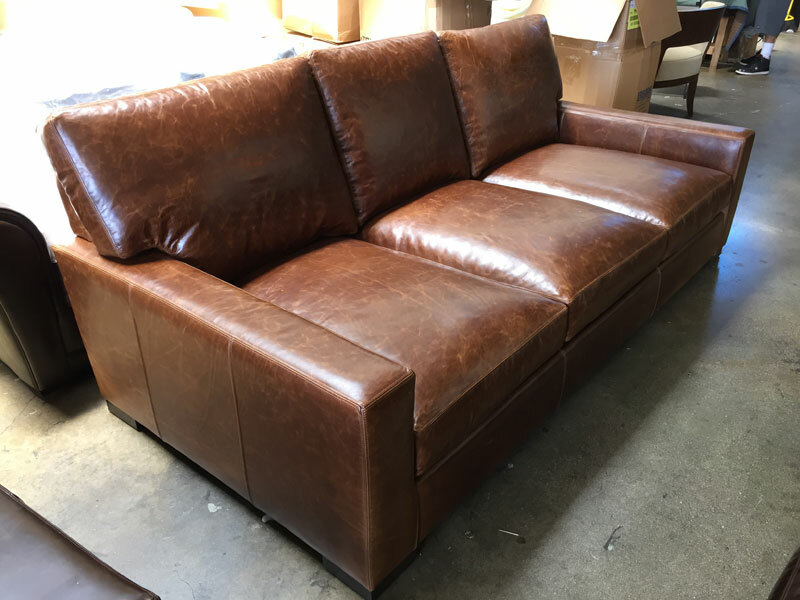 This entry was posted in Custom Leather Order Feed, Reno and tagged Brompton, Brompton Classic Vintage, Brompton Vintage, Italian Brompton Classic Vintage, Reno Leather Furniture Collection, Reno Leather Sectional, Reno Modular Leather Sectional on September 26, 2016 by LeatherGroups. 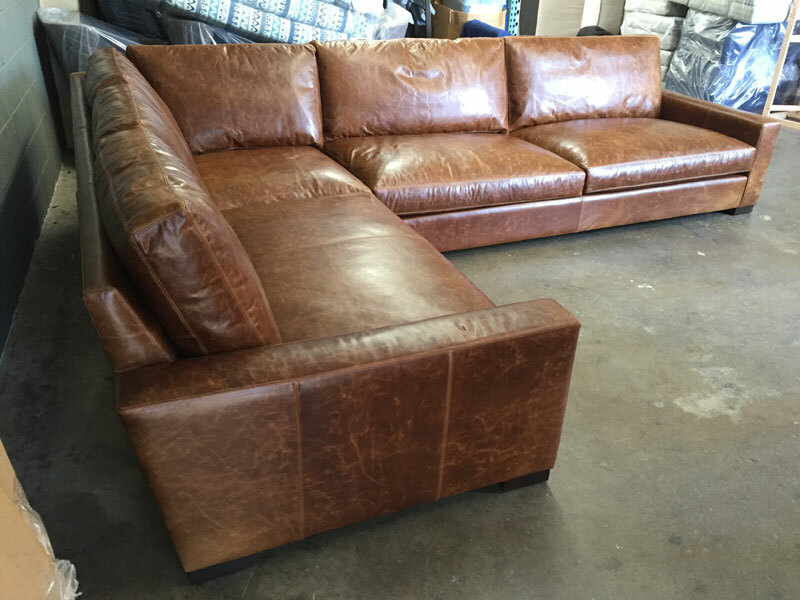 Our customer in Vancouver, Washington is surely enjoying this beautiful Braxton Leather L Sectional. She added 12″ to the 133″ long side of our Braxton L Sectional, for a total of 145″ in length on the right facing side. 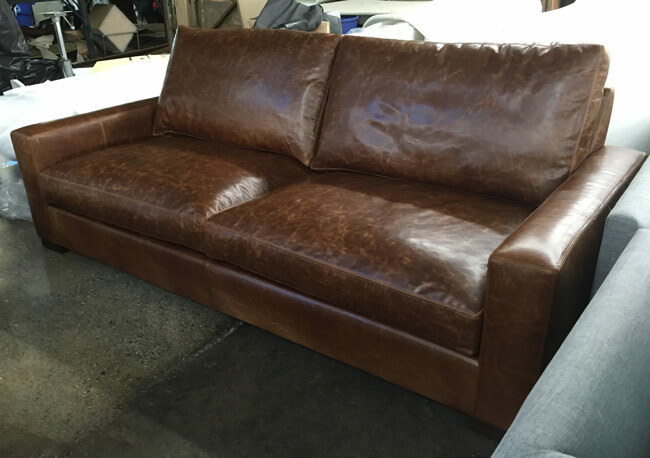 She then opted to go for wider, bench style seat cushions, which creates a roomy, modern feel on this Full Grain Leather Sectional. 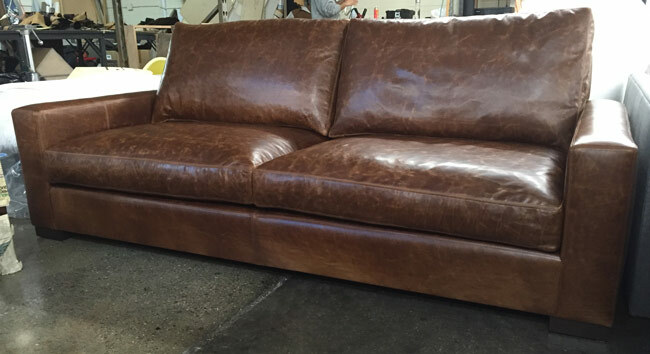 This entry was posted in Braxton, Custom Leather Order Feed and tagged 46" Deep, Bench Cushion, braxton collection, braxton L sectional, braxton sectional, Brompton Classic Vintage, Brompton Vintage, custom length, deep, Italian Brompton, Italian Brompton Classic Vintage, maxwell leather collection, maxwell leather sectional, pure aniline on May 6, 2016 by LeatherGroups. 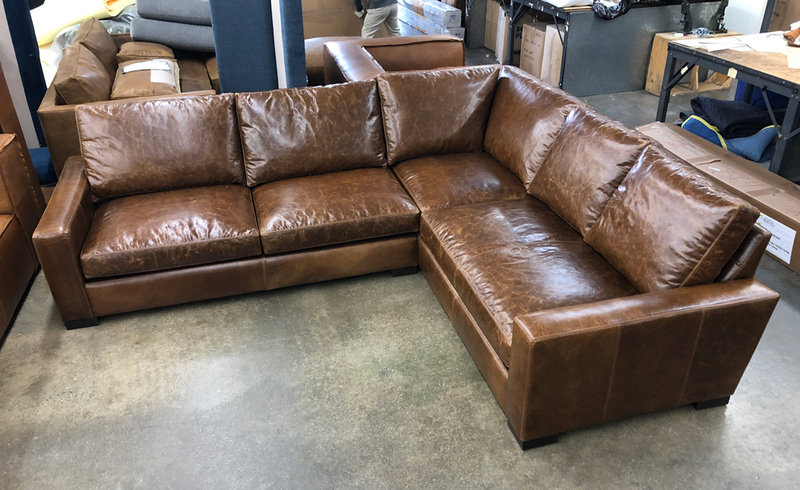 Headed from our factory in California up to Seattle Washington, we’re sure this Braxton Leather Sofa will be the location of more than a few lazy days hiding out from the rain. This customer selected the 90 inch length, our 43″ studio depth and Italian Brompton Classic Vintage leather. This leather is a lighter, warm Chestnut colored version of the popular Italian Brompton Cocoa leather. 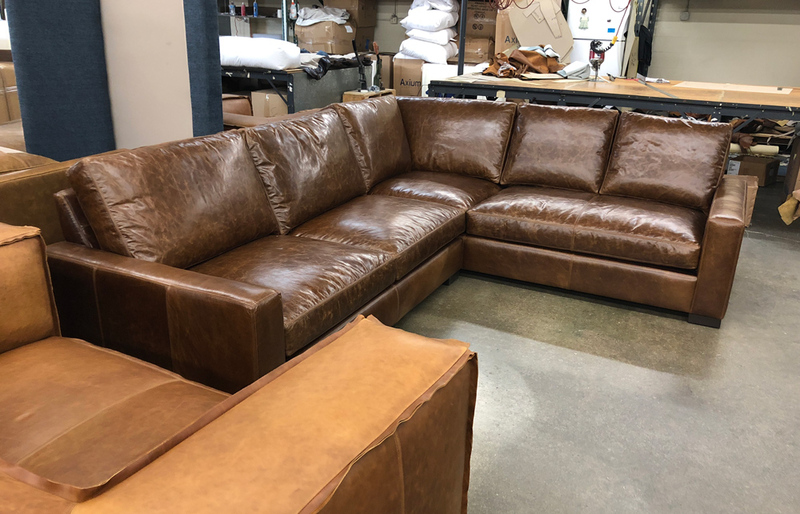 This American made leather sofa started with a solid hardwood frame, which was padded then upholstered in world class leather and finally stuffed with comfortable feather & down and supportive foam cores. 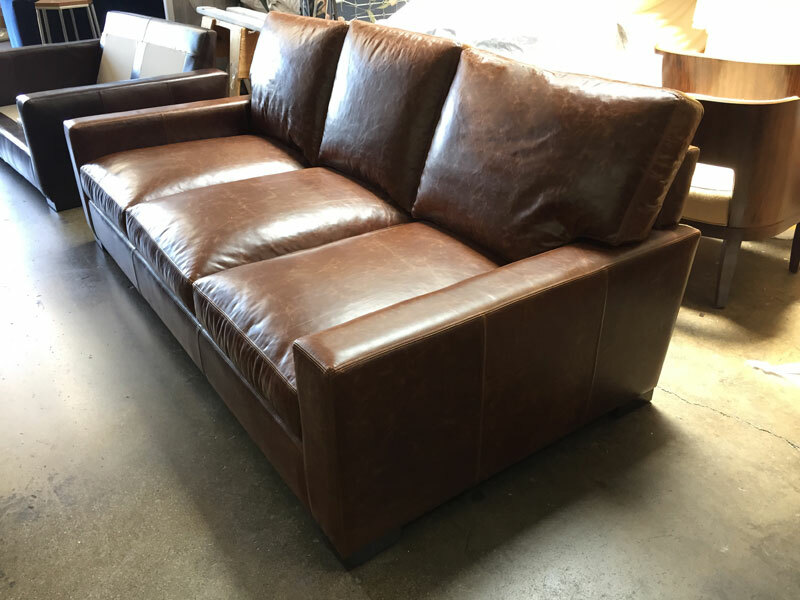 This entry was posted in Braxton, Custom Leather Order Feed and tagged 43" Deep, Bench Cushion, braxton collection, braxton leather sofa, Brompton, Brompton Classic Vintage, Brompton Vintage on January 23, 2016 by LeatherGroups. 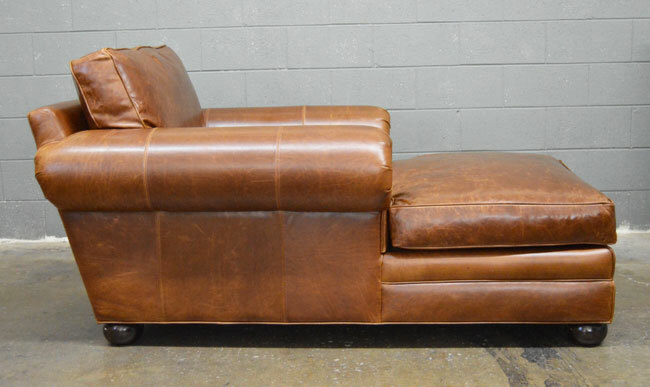 En-route to one of our long-time customers in Michigan, this Langston Leather Chaise wears this Italian Brompton Classic Vintage leather perfectly. The feather & down cushions will make it hard to want to do anything but chill out reading or binge-watching your favorite new show on Netflix! Available with your choice of 8-way Hand Tied, or Heavy 9 Gauge Sinuous Spring suspensions and wrapped in some of the world’s elite Full Grain, Aniline dyed leathers, we start with Solid Hardwood frames and add our Feather & Down topped bottom cushions with Feather & Down stuffed back cushions (watch out for “down seating furniture” with no mention of the back cushion fill, which usually means that cheaper polyester fiber is being used in the back cushions). Our Langstons are proudly built here in America! This entry was posted in Custom Leather Order Feed, Langston and tagged Brompton, Brompton Classic Vintage, Brompton Vintage, lancaster, lancaster chaise, lancaster leather collection, Langston, langston chaise, langston collection on January 2, 2016 by LeatherGroups. 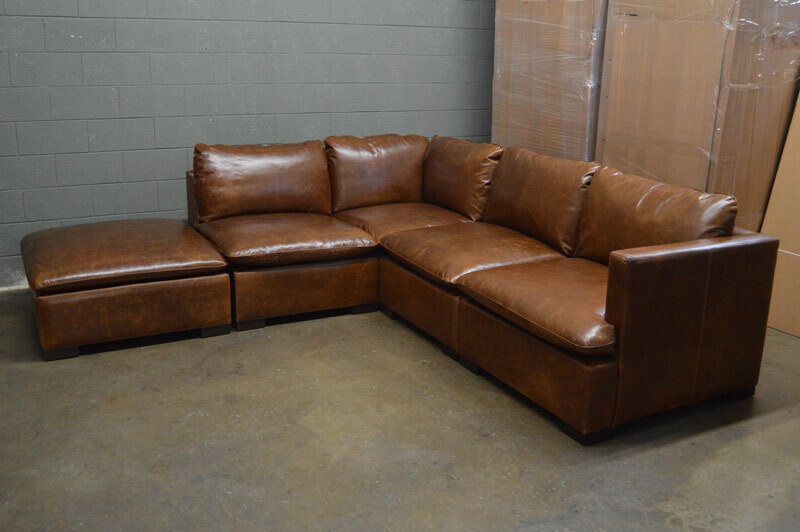 3 cushions are better than 2; at least that’s the case with this beautiful Braxton leather sofa. 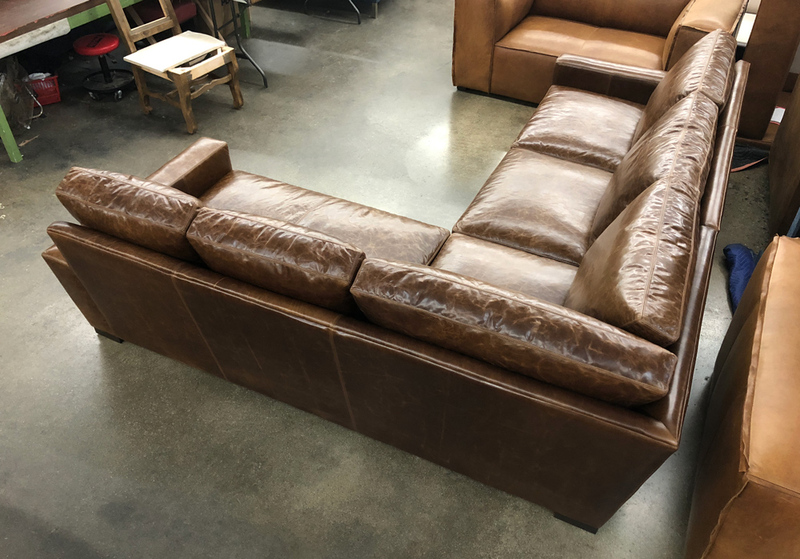 This Braxton sofa is the classic style that paved the way for its slightly more contemporary counterpart, the Braxton Twin Cushion sofa. 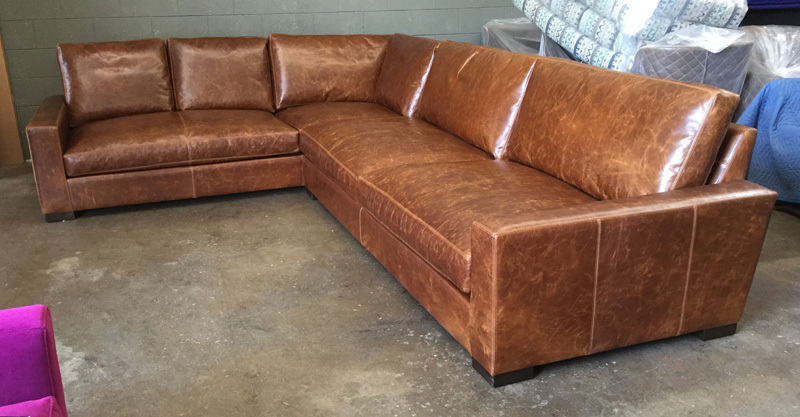 This customer selected the 90″ length and our roomy 46″ depth option with a 3 cushion configuration and “Ears” on the back cushions for each end of the sofa. 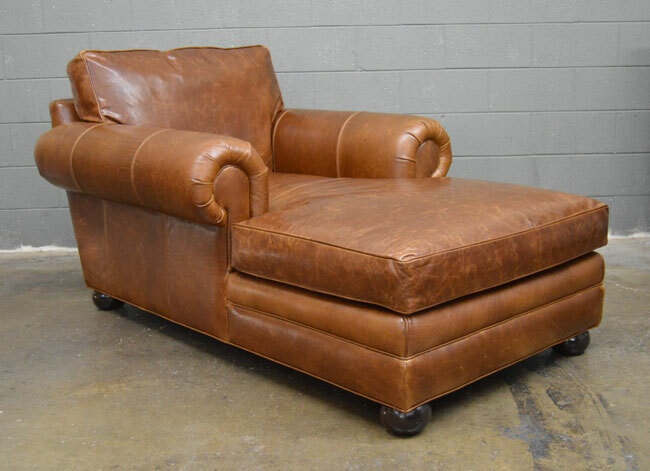 Built in America with feather & down seating and the warm character of Italian Brompton Classic Vintage leather, this one will be sure to make a couple of our customers very happy! In fact this one is on its way to Monmouth, Illinois right now. 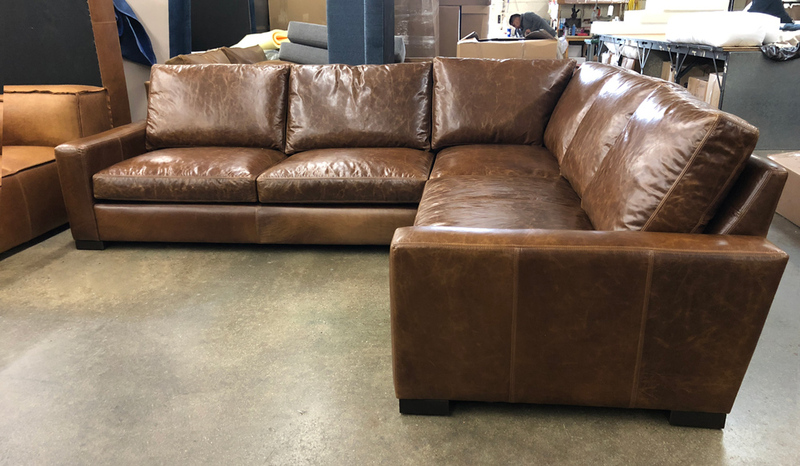 This entry was posted in Braxton, Custom Leather Order Feed and tagged 46" Deep, braxton collection, braxton leather sofa, Brompton, Brompton Classic Vintage, Brompton Vintage, maxwell leather collection, maxwell leather sofa on June 7, 2015 by LeatherGroups. This entry was posted in Custom Leather Order Feed, LeatherGroups.com Reviews & Testimonials and tagged Arizona Leather Collection, Arizona Leather Sectional, Arizona Mini L Sectional, Brompton, Brompton Classic Vintage, Brompton Vintage, customer reviews, Customer Testimonial, Customer Testimonials, LeatherGroups Reviews, LeatherGroups.com Reviews, product reviews, reviews, testimonial, testimonials on December 5, 2014 by LeatherGroups.